The conflation of indentured servitude with chattel slavery in the ‘Irish slaves’ narrative whitewashes history in the service of Irish nationalist and white supremacist causes. Its resurgence in the wake of Ferguson reflects many Americans’ denial of the entrenched racism still prevalent in their society. Supplied by the author from Twitter. It was with a heavy heart and no small amount of anger that I decided it was necessary to write a public refutation of the insidious myth that the Irish were once chattel slaves in the British colonies. The subject of this myth is not an issue in academic circles, for there is unanimous agreement, based on overwhelming evidence, that the Irish were never subjected to perpetual, hereditary slavery in the colonies, based on notions of ‘race’. Unfortunately this is not the case in the public domain and the ‘Irish slaves’ myth has been shared so frequently online that it has gone viral. The tale of the Irish slaves is rooted in a false conflation of indentured servitude and chattel slavery. These are not the same. The tale of the Irish slaves is rooted in a false conflation of indentured servitude and chattel slavery. These are not the same. Indentured servitude was a form of bonded labour, whereby a migrant agreed to work for a set period of time (between two and seven years) and in return the cost of the voyage across the Atlantic was covered. Indentured servitude was a colonial innovation that enabled many to emigrate to the New World while providing a cheap and white labour force for planters and merchants to exploit. Those who completed their term of service were awarded ‘freedom dues’ and were free. The vast majority of labourers who agreed to this system did so voluntarily, but there were many who were forcibly transplanted from the British Isles to the colonies and sold into indentured service against their will. While these forced deportees would have included political prisoners and serious felons, it is believed that the majority came from the poor and vulnerable. This forced labour was in essence an extension of the English Poor Laws, e.g. in 1697 John Locke recommended the whipping of those who ‘refused to work’ and the herding of beggars into workhouses. Indeed this criminalisation of the poor continues into the 21st century. In any case, all bar the serious felons were freed once the term of their contract expired. “White indentured servitude was so very different from black slavery as to be from another galaxy of human experience,” as Donald Harman Akenson put it in If the Irish Ran the World: Montserrat, 1630-1730. How so? Chattel slavery was perpetual, a slave was only free once they they were no longer alive; it was hereditary, the children of slaves were the property of their owner; the status of chattel slave was designated by ‘race’, there was no escaping your bloodline; a chattel slave was treated like livestock, you could kill your slaves while applying “moderate correction” and the homicide law would not apply; the execution of ‘insolent’ slaves was encouraged in these slavocracies to deter insurrections and disobedience, and their owners were paid generous compensation for their ‘loss’; an indentured servant could appeal to a court of law if they were mistreated, a slave had no recourse for justice. And so on.. The prevalence and endurance of this myth is partly due to the fact that it is buttressed by two long-standing narratives. The first narrative comes from the arena of Irish nationalism, where the term 'slavery' is used to highlight the political, social and religious subjugation or persecution that the Irish have historically suffered. In this narrative, the term ‘Irish slaves’ refers specifically to those who were forced onto transport ships and sold into indentured servitude in the West Indies during the Cromwellian era. The 'innocent' usage of this phrase is, to a degree, understandable and its conflation with chattel slavery generally occurs due to a mixture of ignorance and confusion. More objectionable is the canon of pseudo-history books like O'Callaghan's To Hell or Barbados or Walsh and Jordan's White Cargo, which knowingly conflate indentured servitude and chattel slavery. The ‘Irish slaves’ myth is also a convenient focal point for nationalist histories as it obscures the critically underwritten story of how so many Irish people, whether Gaelic, Hiberno-Norman or Anglo-Irish, benefited from the Atlantic slave trade and other colonial exploits in multiple continents for hundreds of years. The second narrative is of a more sinister nature. Found in the websites and forums of white supremacist conspiracy theorists, this insidiously claims that indentured servitude can be equated with chattel slavery. From Stormfront.org, a self-described online community of white nationalists, to David Icke’s February 2014 interview with Infowars.com, the narrative of the ‘White slaves’ is continuously promoted. The most influential book to claim that there was ‘white slavery’ in Colonial America was Michael Hoffman’s They Were White and They Were Slaves: The Untold History of the Enslavement of Whites in Early America. Self-published in 1993, Hoffman, a Holocaust denier, unsurprisingly blames the Atlantic slave trade on the Jews. By blurring the lines between the different forms of unfree labour, these white supremacists seek to conceal the incontestable fact that these slavocracies were controlled by—and operated for the benefit of—white Europeans. This narrative, which exists almost exclusively in the United States, is essentially a form of nativism and racism masquerading as conspiracy theory. 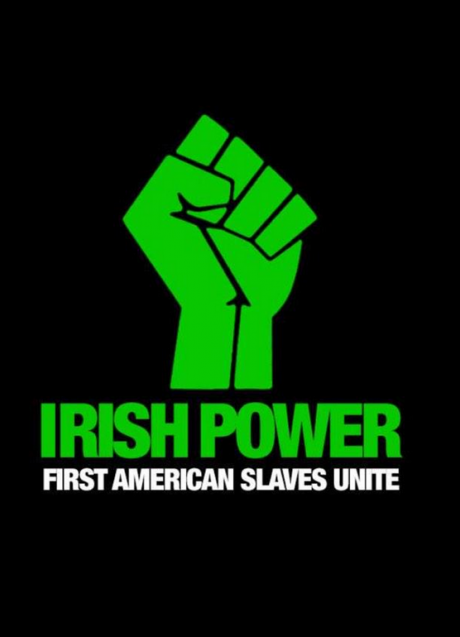 Those that push this narrative have now adopted the ‘Irish slaves’ myth, and they use it as a rhetorical ‘attack dog’ which aims to shut down all debate about the legacy of black slavery in the United States. This myth of convenience is being utilised by those who are unwilling to accept the truth of their white privilege and the prevalence of an entrenched racism in their societies. In the wake of the Ferguson shooting, both of these narratives were conjoined in a particularly ugly fashion. Many social media users, including some Irish-Americans, invoked this mythology to chide African-Americans for protesting against the structural racism that exists in the United States (see a collection of tweets on ‘Irish slaves’, gathered by the author). 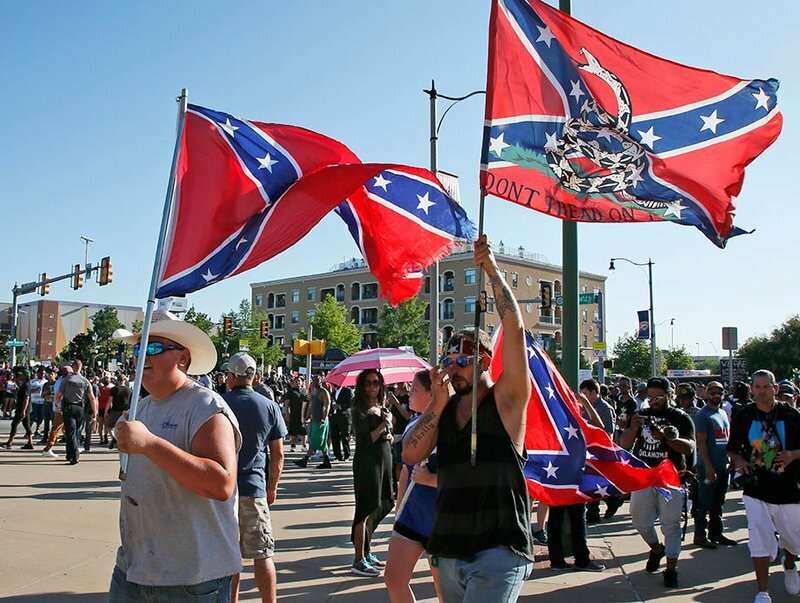 Furthermore, they used these falsehoods to mock African-American calls for reparations for slavery, stating “my Irish ancestors were the first slaves in America, where are my reparations?” Those that share links to spurious ‘Irish slavery’ articles on social media have also been appending their posts with the hashtags #Ferguson and #NoExcuses. No excuses? This myth of convenience is being utilised by those who are unwilling to accept the truth of their white privilege and the prevalence of an entrenched racism in their societies. There is clearly comfort to be found in denialism. The conflation present in both narratives has been abetted by the deliberate use of a limited vocabulary. The inclination to describe these different forms of servitude using the umbrella term “slavery” is a wilful misuse of language. It serves to diminish the reality of the chattel slave system that existed in the New World for over three centuries. It is also a reminder that the popular use of such a simplistic term as ‘modern-day slavery’ can reduce clarity and hinder our collective understanding of both the present and the past. This piece is based on Liam’s longer essay, ‘The myth of “Irish slaves” in the colonies’.